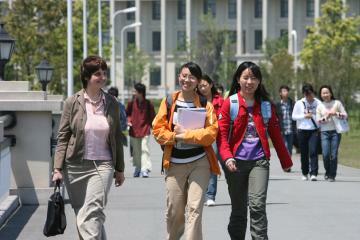 Record Numbers of International Students in U.S. The number of foreign students attending American colleges hit an all-time high in 2008, capping three consecutive years of vigorous growth, according to new data from the Institute of International Education. Some 671,616 international students attended U.S. institutions in 2008-9, an increase of almost 8 percent from a year earlier. First-time-student enrollments grew even more robustly, by nearly 16 percent. UK remains second to the US in international student recruitment but the competition is clearly getting more and more fierce. This entry was posted in HE, international, Students, University and tagged admissions, Chronicle, HE, international, recruitment, student numbers, Students, universities, USA, world by Paul. Bookmark the permalink.